So how do you direct funding for things like health and longevity, community-building and integrated neighborhoods, and economic stability for local families? You make parks and green space central to urban development, a core passion for Dahlkemper. The Erie native, a mom of five, had her career as a clinical dietician take her from Pennsylvania to Texas and back again. In 1998, she and her husband Dan co-founded the non-profit Lake Erie Arboretum at Frontier Park (LEAF), and as the park’s executive director for 10 years, Dahlkemper raised over $2 million for improvements and amenities. 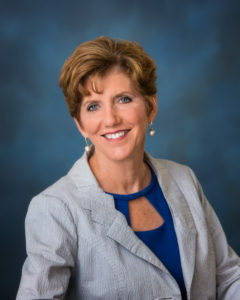 On her first run for office, she was the first woman ever elected to the U.S. House of Representatives for the 3rd Congressional District of Pennsylvania, serving from 2009-2011. She began her current office in Erie in early 2014. Erie County is unusual, she says, because many years ago, its parks were all given over to the municipality. Their maintenance, amenities, and programming (from bike trails to concerts to dog parks) come from a mix of state dollars allotted for parks, greenways, and trails, and partnerships with regional non-profits (like LEAF) and volunteer groups. But even though the County does not own the parks (a mix of relatively wild natural forest, gorge, and lakeside stretches and developed urban outdoor spaces), its planning department, “the only planning professionals with Erie County,” has a role in a new initiative for Parks and Recreation in Erie, which will better prioritize existing funding, with community input. Dahlkemper notes that even for city-dwellers with a yard, urban parks create crucial common space for movement and health—more important than ever when the American Academy of Pediatrics recommends that children get outside for an hour every day, but many school policies prohibit kids even from walking to school without a guardian. “Often when we look at funding cuts,” things like parks and trails are the first to go, but “we really know the long-term costs of an inactive society are huge,” she says. She hopes that lessons from “Blue Zone” cities around the world (whose residents enjoy the longest, healthiest lives on Earth) could be brought home to Pennsylvania through better support for more active lifestyles. 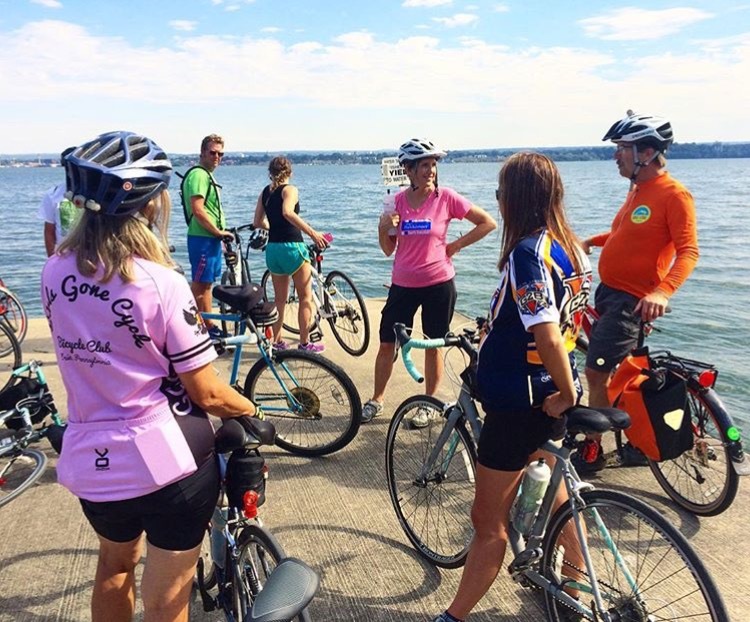 Kathy Dahlkemper (center) and a group of cyclists at Presque Isle State Park during her annual Bike Around the County ride in 2015. “One of the things I’m an advocate of is bike trails,” she continues. These ensure that city-dwellers can more easily take in some nature, and rural dwellers can take advantage of more developed parks with amenities like amphitheaters or tennis courts, for a better-connected park system overall. Dahlkemper loves to bike herself, for exercise, a way to travel, and a way to see the community that’s impossible from inside a car. She regularly invites PennDOT officials and staff from local health and planning departments to bike alongside her, and the result is a better awareness of multi-modal safety issues, which informs new road projects. “PennDOT guys say you learn so much more riding around on your bike then you do in a truck,” she says.